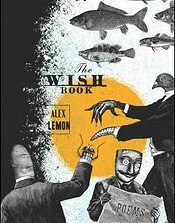 From “big jellyfish, All grown-assed” to “rain-laden / Lilacs,” Alex Lemon’s newest poetry collection, The Wish Book, is filled with everything. In a way, this reminds me of Dara Wier’s newest collection, You Good Thing, which binds together a variety of dissimilar matter. While the contents of both collections are concretely tangible as well as intellectually provocative, in Wier’s book, the results are redefinitions of the world we live in. Lemon is less interested in reinterpretation. Instead, The Wish Book’s vast scope of material pursues equilibrium. The best disaster I can be. These lines show us that being a hot mess is not antonymous to greatness. Another example of this pursuit of balance can be found in the title, “Still Life With Birthday Cake & Dynamite.” Somehow this celebration of birth, complete with sweet confections, and this impending, unavoidable death, which is about to blow up in our faces, exist together within one captured moment. This concept that something can be both lovely and horrifying seems to be the thematic core of Lemon’s book, as seen in the couplet that begins the collection: “Let’s go my little paradise, / My little heart attack.” Appropriately, this opening poem is titled “Boundless,” and it sets the tone for the collection. & again, the cat in Saran Wrap. Call it terrifying or comforting—or both—but “Let Us Get Our Gifting On” demonstrates that nurturing and damaging are, perhaps, not so different after all. And maybe The Wish Book teaches us that this is okay and, of course, not okay, all at once. Heather Lang’s poetry has recently been nominated for a Pushcart Prize and published by Cider Press Review, The Del Sol Review, IthacaLit, Jelly Bucket, and Mead. She serves as Assistant Editor for The Literary Review and has reviewed for Atticus Review, Gently Read Literature, and HTMLGIANT.